Abraham Nii Attah (born 2 July 2001) is a Ghanaian actor, living in the U.S. for his career and education. He hails from the Ga–Dangme ethnic group in the Greater Accra Region of Ghana. He made his feature film debut in Beasts of No Nation (2015). 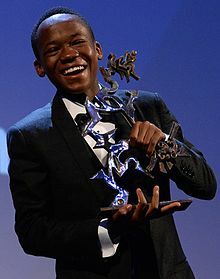 For his leading role of child soldier Agu, Attah was awarded the Marcello Mastroianni Award for Best Young Actor at the 72nd Venice International Film Festival. He was made an Ambassador for the Free Education Policy in Ghana, after having supported the policy with a picture endorsement. In 2017, he appeared in the Marvel Studios film Spider-Man: Homecoming. He has joined the ensemble cast of Shane Carruth's third film, The Modern Ocean. ^ Guerrasio, Jason (April 27, 2015). "The director of Netflix's next movie plucked his lead actor from the streets of Ghana". Business Insider. Retrieved September 13, 2015. ^ Collin, Robbie (September 12, 2015). "Venice: 'From Afar' winning Golden Lion is a welcome surprise". The Daily Telegraph. Retrieved September 13, 2015. ^ Sage, Alyssa (December 21, 2015). "Black Film Critics Circle Name 'Creed' Top Film of the Year". Variety. Retrieved January 19, 2016. ^ Sarpon, Yaw (December 31, 2015). "Ghana Movie Awards 2015 Winners – See Full List". GlammyNews.com. Retrieved January 19, 2016. ^ Khan, Alia (February 27, 2016). "2016 Film Independent Spirit Awards Winners Announced". filmindependent.org. Retrieved February 27, 2016. ^ Lawrence, Jordan (December 1, 2015). "National Board of Review Announces 2015 Award Winners". National Board of Review. Retrieved January 19, 2016. ^ Davis, Clayton (January 19, 2016). "2015 Awards Circuit Community Awards Nominations – 'Mad Max' Leads While Mara Is A Lead". AwardsCircuit.com. Retrieved January 19, 2016. ^ Davis, Clayton (December 14, 2015). "St. Louis Film Critics Nominations – Kristen Stewart and Abraham Attah Make the Cut". AwardsCircuit.com. Retrieved January 19, 2016.